After some snow showers and freezing drizzle this morning, we saw calm and cloudy skies this afternoon — a needed respite prior to tomorrow’s weather. 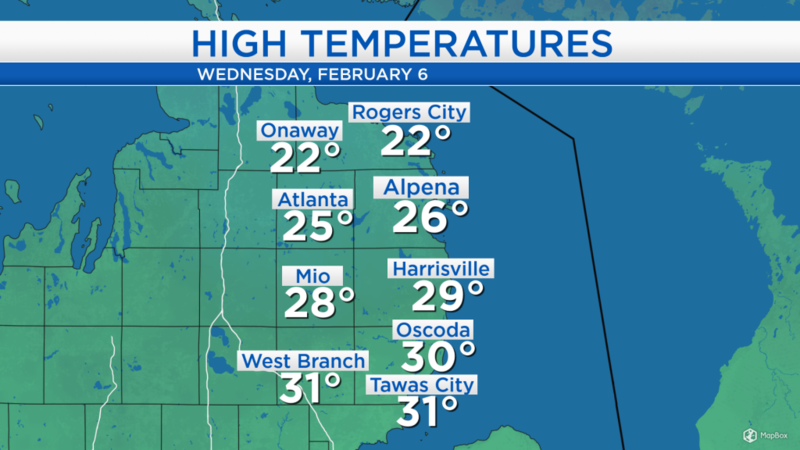 High temperatures reached pleasantly seasonable values, mostly in the middle to upper 20s. Our weather will remain uneventful this evening. A storm system currently over Colorado is spreading snow as far north as Minnesota and North Dakota. The storm system will intensify as it travels into our state tomorrow. 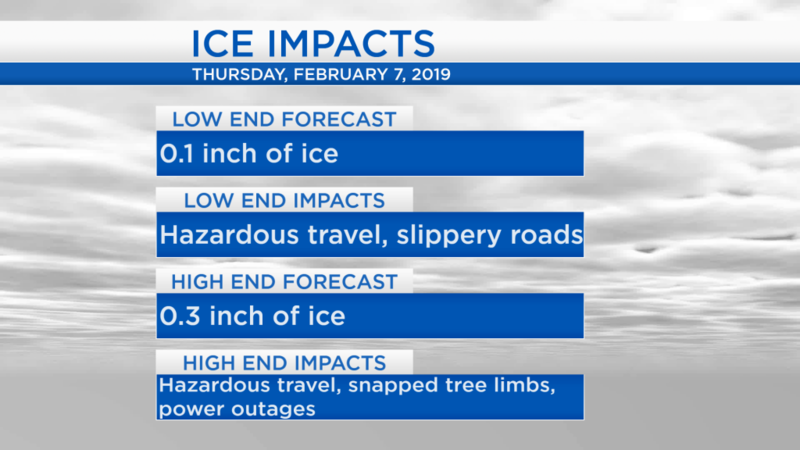 For our area, sleet and freezing rain creating icy conditions will be a concern, beginning tomorrow morning and becoming more intense for the afternoon. In our area, the National Weather Service has issued a Winter Weather Advisory (shown in gray) beginning at 7 a.m. tomorrow morning, continuing until 7 p.m. tomorrow evening. 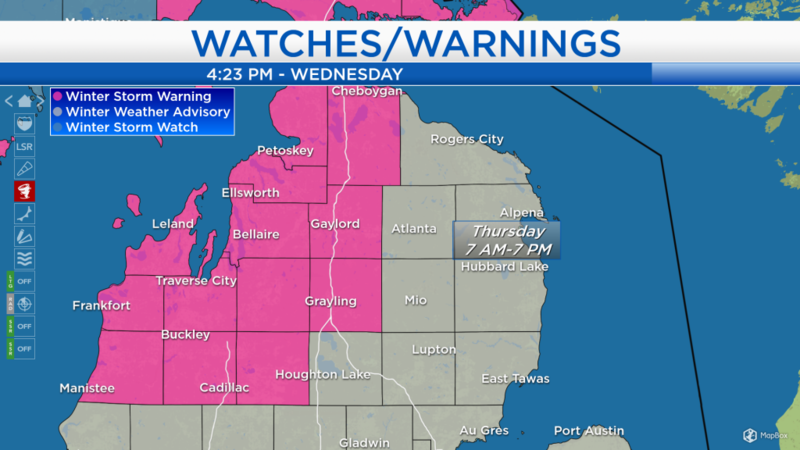 For the areas in pink to our west, a Winter Storm Warning is in effect starting tomorrow morning and continuing through Friday for mixed precipitation (snow/sleet/freezing rain) on Thursday and then lake effect snow on Friday. For Northeast Michigan, 0.1 to 0.3 inches of ice are expected tomorrow. The low end of that range would result in dangerous, slippery road conditions due to ice buildup. But the high end of that range would result in further issues, the weight of thicker ice buildup would cause tree limbs to snap and fall, and possible power outages. Tomorrow, high temperatures will reach the mid-30s during the evening. By that time, after several hours of ice, a period of rain is likely for a short while. Precipitation resulting in ice is shown in pink on the map below. Winds will remain light into tomorrow afternoon, about 10 mph out of the east. Then wind speeds will strengthen on Friday, shifting out of the west about 20 mph. 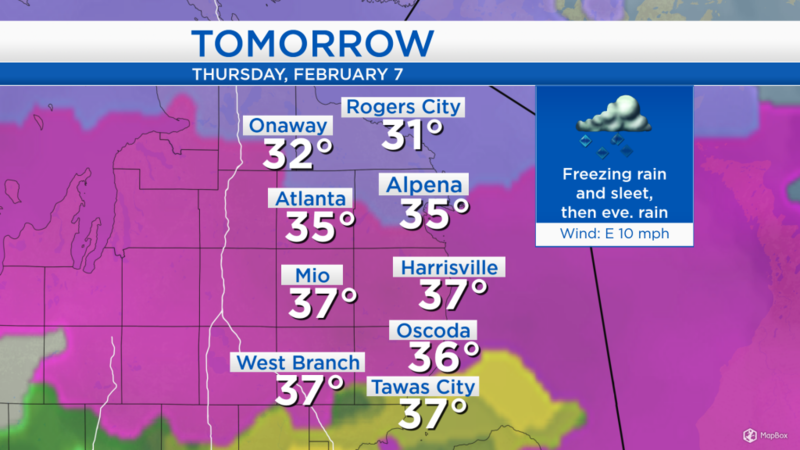 Travel tomorrow will become difficult as ice buildup begins during the morning and thickens in the afternoon. The icy wintry mix will change to rain for a period during the evening, when temperatures will climb above the freezing mark, reaching the mid-30s. On Friday, winds shifting out of the west will bring in significantly colder air from the Upper Plains. 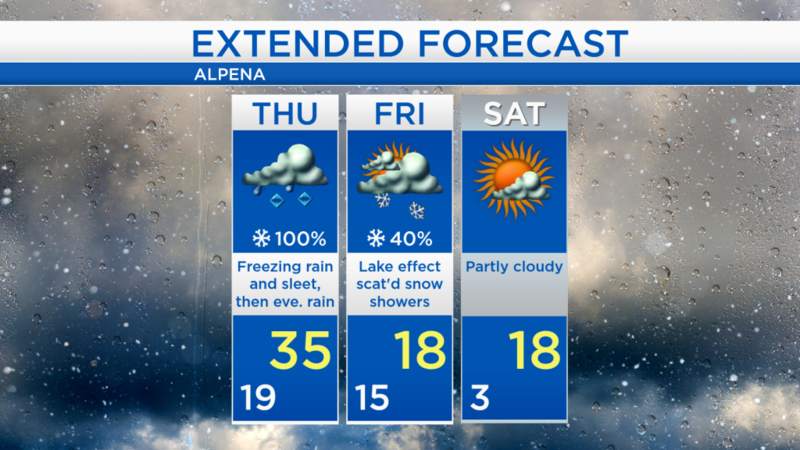 A few lake effect snow showers are possible on Friday with highs only in the upper teens. Finally, some dry weather will arrive on Saturday with some sunshine and highs in the upper teens. For the rest of Northeast Michigan’s weather forecast, watch the latest weather video by clicking the weather tab at the top of the page.